The universally uneasy relationship between a woman's father and her boyfriend/husband was taken to the hilarious extreme with "Meet The Parents". With its sequel "Meet The Fockers", the same uneasiness between opposing sets of in-laws was tackled. The third instalment of this popular series goes back to the original idea, but with twists, and the next generation thrown in. Yet if your idea is only to relive the old times this one works, but if you're looking for original, new gags this one proves boring. Gaylord 'Greg' Focker (Ben Stiller), now proud father to a boy and a girl, may have got his father-in-law Jack's (Robert De Niro) trust, but is still not out of his suspicion radar. After suffering a minor heart attack, Jack wants Greg to be the 'man' of the family but suspects him of having an affair. The two men collide with each other, trying to gain control of the family. Does 'nurse' Greg have it in him to retain control over his own life? 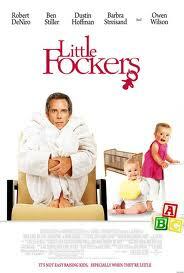 One of the many problems with "Little Fockers" is it is not really about the little ones in the family. The rivalry between Greg and Jack is back, with the same humour thrown in that we have come to see in the first two parts. Only this time Greg, aware of his father-in-law's methodology, manages to gives it back to him. There are some funny moments in the film, but overall if you have seen the first two, there isn't much that you can expect from this. The same jealousies, insecurities and gags are back, and sadly without the comfort of wearing a different garb. The film lacks new wit, and the little it has like the term "god-focker" instead of godfather is overdone. Perhaps the director's chair, helmed this time by Paul Weitz with original director Jay Roach now acting as the producer, is another problem. Or perhaps it is the problem of the film's space, where there isn't much original left to explore between the relationships of the people who inhabit it. So the film relies upon some stunts, like a friendly appearance of Deepak Chopra or Jessica Alba in a role that's almost like a cameo. Yet it is a watchable film that flows smoothly enough without much jerk of narration or story or acting glitches from an ensemble cast of some of the best actors in Hollywood.